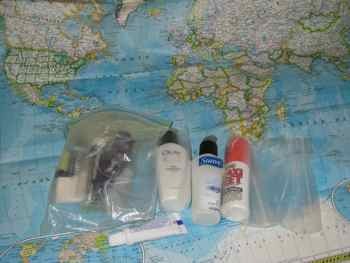 You must declare your liquid, gel, aerosol and cream medications... if they do not fit in your plastic bag. You do not need to declare pills or powders. The TSA requirements and other travel security sites say that you must declare medications at the security checkpoint for screening if you carry them outside of the allowed plastic bag. We think it would just make it easier if you made a list of the prescriptions and other essential medications you will take in your carry-on luggage. But if you have to carry more than 3 ounces of medication, you will have to carry it separately. If your bag is already full of toiletries, you may want to carry any of your liquid or gel medications separately so you can get everything you need into your carry-ons. We've gone into more detail in traveling with pills and packing medications on those respective pages. If you have a lot of medications to take, you could make a list and put it on a form to declare medications and medically necessary liquids that you could hand to the security agent to speed things up. Here's a sample form to declare medications. Copy it, customize it for your own medications, fill it out and carry it with you. (Just so you know... we do not make a list like this... but we don't take any liquid medications. Baby food ____ Baby food or baby formula ______of _____oz. Medication ____ Over the counter medication ______of _____ oz. Medication ____ Bottles of liquid medication of _____ oz. Fill in how many tubes, bottles or jars you have and how many ounces of each you're carrying. Make a few copies so you can leave it at security if you need to. We hope this helps!